Over the last couple of weeks I have searched through the forums and found several similar issues and I have tried several of the suggestions. However, I've had no luck and I am stumped... my photos all at once disappeared from my gallery. 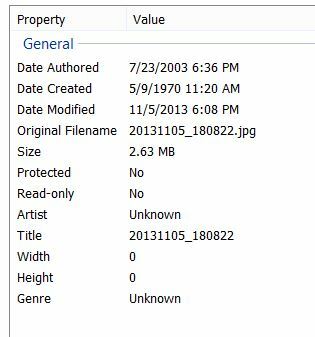 If you look in the folders they are all still there but all of the old photo's have the same Authored Date (7/23/2003 6:36 PM) and the same Date Created (5/9/1970 11:20 PM) the Date Modified is unique as it is the actual date the pictures were taken... These files are not hidden. I do not remember exactly what day I upgraded to 4.3 but it would have been right around the time that the issue started. I tried Scan Media and Rescan Media apps with no success. Any help will be appreciated, and if this is addressed somewhere and I have missed it I am very sorry for the redundant thread. Hey Dexter. Were the pics saved on your SD card or in the internal storage? If you connect to the PC can you see the pics or at least the files? Yes, I can see the files from the PC or even by searching ES File Explorer. Can you view the pictures? And can you transfer the files onto the PC? Yes I can view the pics from the ES app or the PC. From the ES app the only option you have is to set pic as a wallpaper etc now from the PC I can copy them. also any new pic I take is fine... it will be in the same folder when you search and they have not issues as far as the gallery etc. Just what I was about to ask hehe. If you move them to the PC then back, do they work? I did as you suggested and copied them to the PC and then tried to bring some back over but no dice. Did this every get resolved? I just had this occur to me 3days ago and it's driving me nuts because it is also creating other issues. Happened when a friend sent a photo to me via Bluetooth. I cannot reverse what ever happened. Note 2: does the plug in charger go bad? No New Camera App In 4.3?